Why You Should Read this Chapter: After all your efforts in carrying out your project, you should put your results to good use. Here we provide suggestions concerning the presentation and sharing of your information. After you, the citizen scientist, have put forth the effort to identify the problem (discussed in Chapter 1), to collect currently available public information (discussed in Chapter 3), and to generate new information (discussed in Chapter 5), you should put the results of your efforts to good use. As delineated in Chapter 2, there is a broad spectrum of potential uses of your information (e.g., to stimulate public awareness, to influence lawmaking, for enforcement mechanisms, etc.). There are various ways to make the most out of your information. Here, we provide a few suggestions. First, structure your information to make it presentable. Begin by considering ways in which you can present your work concisely and clearly to a broad audience. In many instances, simplicity empowers an argument. Translate your results into plain language and use graphs, tables, and other visualization techniques to facilitate emphasis and rapid understanding of your arguments. Next, consider your primary target audience. In some instances, this audience will require that the information be submitted in a certain format (e.g., documents submitted for court proceedings). Take time to research whether your information use has a formatting requirement. Importantly, when in doubt, seek outside advice and guidance. Second, use your information in any way you can. 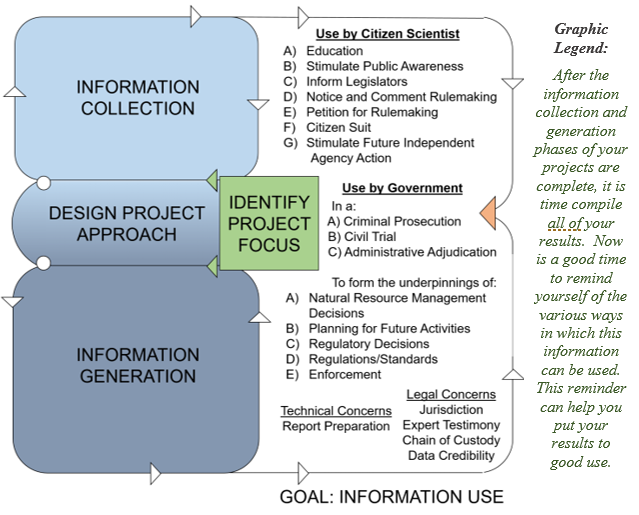 Although you may have begun your work as a citizen scientist with a specific use or goal in mind, consider other ways in which your information can be used. Maximize the value of your efforts by thinking creatively about other uses of your information. Finally, build upon the information that you have collected and generated. In some instances, you can consider collecting or generating more information to make your argument more sound and convincing with increased evidence. In other instances, your work may bring to light additional issues that merit exploration. Alternatively, you can provide opportunities for others to build upon your work by making your information as accessible as possible. For example, you can consider making your information publicly available on an internet platform. To some extent, this sharing can serve as a “peer-reviewing” mechanism. When other independent individuals reproduce your results, the credibility (i.e., quality) of your information increases. In this way, quantity can be equated with quality.